It’s that time of year. The team at Boris FX is excited to deliver three major releases this fall across our famed flagship products - Sapphire, Continuum, and Mocha. First up, the world’s most powerful planar tracker! Meet Mocha Pro 2019. 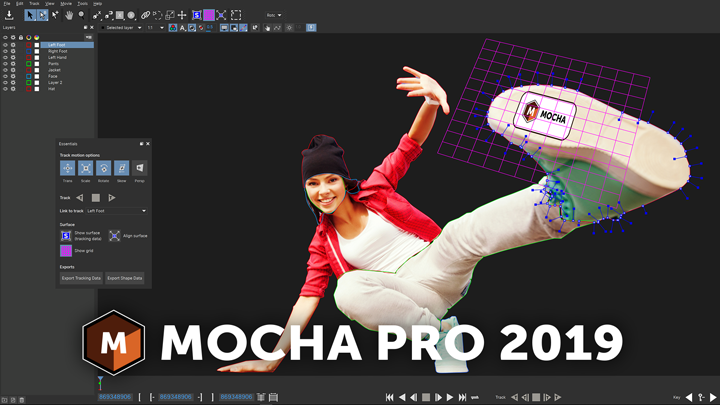 Mocha Pro 2019 builds on our Academy Award-winning planar tracking engine with faster, GPU-accelerated object removal; new magnetic and freehand spline tools to assist roto work; updated surface tool; new high resolution user interface and workspaces; and stereo 360/VR project support is now a standard feature. Woo-hoo! A win-win for traditional and next-gen 360 filmmakers. Take a quick video tour of new features with product manager, Martin Brennand. Mocha Essentials workspace with streamlined user interface: Makes planar tracking easier to learn and master than ever before. GPU-accelerated object removal: Delivers up to 4-5x speed increases on the most challenging object removals and clean plating shots. Accelerated masking & roto with new spline creation tools: Adds magnetic spline with edge snapping, freehand spline tool, ellipse, and rectangle tools. 360/VR - Mocha Pro 2019 now includes all of the features from Mocha VR for mono and stereoscopic 360 video workflows. Retina/High DPI monitor resolution support, updated surface tool, new RLM based licensing system and more. Mocha Pro is now officially part of the Boris FX U&S (Upgrade & Support) plan and moving to a yearly release cycle. Free updates for U&S: Customers who purchased either Mocha Pro v5 or Mocha VR within the last year, qualify for a free update to Mocha Pro 2019. Questions? Check the Mocha 2019 FAQs or contact our sales team.